Cute! Right up my alley, though I don’t know if I could get my man on board. 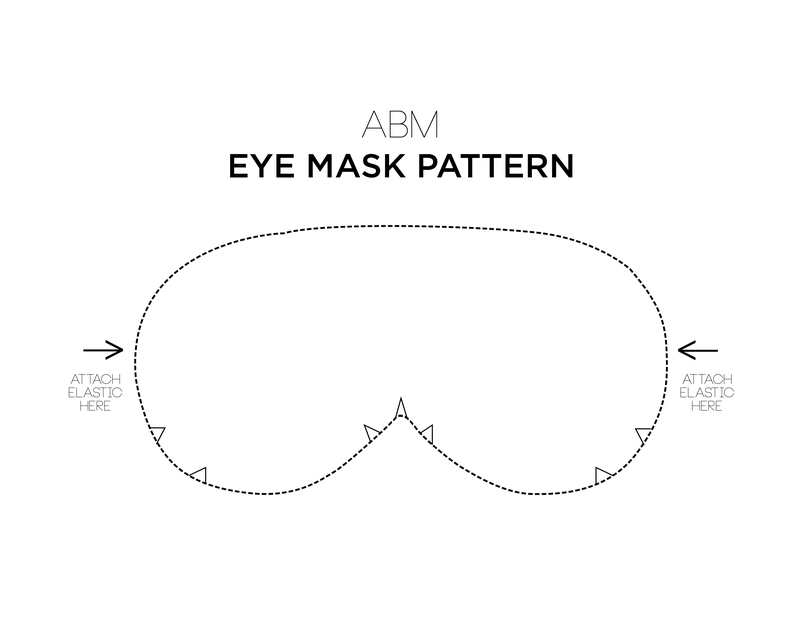 Great Tutorial!I was actually thinking about buying a new sleep mask!My other one is not in the best condition,lol! So cute! My husband and I both love sleep masks, I will have to make a personalized one for him! These are cute! But, I have an added issues. I can’t have anything pressed against my eyes. So, I have have something that is hollow on the inside where the eyes would touch. This makes it really difficult to have cute eye masks. Any idea how I can make my own? I’ve been wanting to make a sleeping mask with eyelashes on them. Looks good! TOO cute! Ahhh! I’m never too bothered by light when I’m sleeping, but I may have to make one of these simply for the adorableness factor! Oh I want to make one so bad. So cute! Love the eye one, very audrey. The little eyelashes are so cute. What a great idea. Super cute. I have a store bought eye mask with eyes that I love to wear on airplanes! These are adorable! I have to have darkness when I sleep, and this would be great for me on those bright mornings! Oh, this is great. I can’t sleep with any lights on. I’m ready to make this sleeping mask. Eyelashes is my choice, really looks cute.Thank you for share. My favorite eye mask of all time was Audrey Hepburn’s in “Breakfast at Tiffany’s.” In college, I had a “Breakfast at Tiffany’s” party for some girlfriends and we made them but I lost mine…Oops. Maybe I should make another? what a cute little day! I love this! So adorable and would definitely make a cute gift! I never knew how sensitive I was until I lived in a sorority house. I had survived freshman year with just one roommate and sophomore year solo. However junior year was a wake-up call (literally). Living with so many other girls, on such different schedules was not fun. I found myself waking up constantly before I needed to, so I too had to invest in some earplugs. These eye-masks are seriously darling! These are adorable Laura. What fun ideas! I’m a light sleeper so I’ll definitely be adding this to my DIY pinterest board. Love the addition of the eyelashes. So cute! Thanks for the DIY idea! Very original, we don’t use this mask but it’s very lovely! Yes! I use a panda eye mask because I love morning light so I keep my curtains open – love it. Hmm…I wonder if this would also help deter my cat from batting me in the face every morning…! This is a cute idea! You could also use it as an eye mask for stress relief by filling in the center with uncooked rice with some essential oils like lavender or peppermint. they look great loving the eyelash ones, so retro looking. Love the idea. I will make one for my friends birthday! precious. my eye mask is my life saver!! I could definitely use a back up, but never thought of making my own. thanks! I love these!! And especially that Holly Golightly-inspired one! These sound like a great idea! And so much more fun and cheaper than buying them. Looking forwards to when I try them out! Oh my gosh! I forgot all about that eye mask in Breakfast at Tiffany’s, and this post brought back nostalgic memories. Thanks so much for the tutorial! I may have to make a few as gifts soon… probably with the movie playing in the background. I love the giant eyelashes! Super fun. So cute! Looks like the Breakfast at Tiffany’s one! Very cute 🙂 love it ! Hiiiiii, OMG this is amaaaazing!!!!!!! i just found what i was looking for, thanks a loooot, i am a moroccan girl and here in morocco they don’t sell like those, so i already decided to do it myself but i didn’t how, thanks again!! I will be making these soon! I used to sleep like a rock, but for some reason I don’t anymore. This is so cute! My husband sleeps with a pillow over his eyes.. maybe I should make him one! You read my mind- Just the other night I was thinking that I want to make one of these! So perfect- Thanks!! This is super cute! I love the eye mask she has in Breakfast at Tiffanys! The big lashes make sleeping so glamorous! Thank you so much for this pattern! I realize I’m about three years too late, but it’s much needed right now! I work NOC shift at a nursing home and by the time I get home and get to sleep, it’s light outside and makes it hard to sleep. Working on my very own mask right now! Thanks a million! Awesome sleep masks. I love to sleep with the sleep mask. I will definitely make them. Thanks and keep sharing.